We would like to invite you to join us for a dedication, blessing, and recitation of the brand new Paganistan Reclaiming Pagan Prayer Beads. We hold each other in solidarity and delight. We are weavers of change. We revel in the abundance of our diversity. Friday, March 21, 2014, 7:00 – 9:30 p.m.
Bring food, non-alcoholic drinks and other treats to share. We do hope that you will join us for this celebration. Please refrain from wearing scents or perfumes. As much as possible this is a scent free space. You are invited to bring your personal prayer beads and prayers, or other examples of prayer beads, if you’d like to share these with community on Friday evening — we will have a separate table set up where all will be invited to display their own beads. These prayer beads belong to our community. 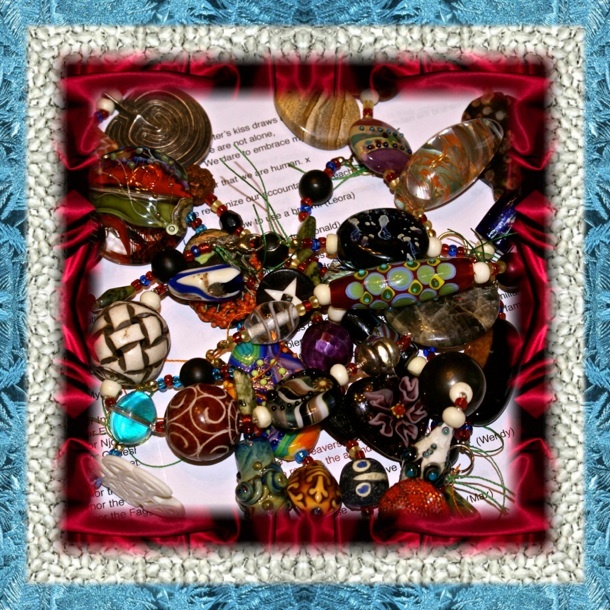 All in our local Reclaiming community are welcome to check the beads out for events or transitions (such as weddings, births, birthdays, namings, dedications, elder ceremonies, rites of passage, or mediations, transitions, deaths, funerals, or other times of celebration or struggle or mourning). Max Gries will be the first Bead Keeper — for the next 3 years, Max will keep the beads and maintain a system of checking them out to others in community and getting them back, of repairing them when needed, of adding beads to a few of the tails as needed. This role will then move to someone else in community. Max will bring the beads to the Spring Equinox ritual on Sat, March 22, and will display them along with the prayer for all to see — however, we will not read them at that ritual. They are available for use in the open rituals in the future if the ritual planning teams are interested. Contact Max in person this Friday or Saturday, or by email at maxgries (at) gmail.com at any time to arrange to have the prayer beads for an event or transition of any sort.